3 hrs away. The kennel floors at the shelter were being refinished & all their dogs had to be cleared out. It wasn't in the budget to board them all & there weren't enough foster homes available. Through the efforts & e'mails of a group of rescuers, many of the dogs were set up with rescues in other areas. 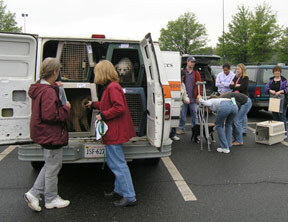 A van-load of dogs was brought to our area & reps from various rescues were there to pick them up. CR!FR found a permanent home for one dog ("Goober", now named "Rozenkranz") & we're fostering Chino & Java here. They're very puppy-rowdy but are learning manners well. They're also very affectionate, lots of fun & very sweet! Nervous Chino makes his way off the van. 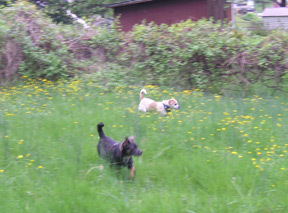 went for a romp in the back yard. 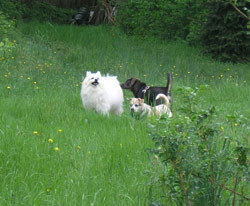 L-R: Max, Java & Chino. Chino & Java are brothers, although Java is a good 7lbs heavier & a bit bigger than Chino. They're now around a year old. Java is a bit mellower, Chino is an imp! They're both extremely affectionate & friendly. These all-American mutts seem to be part beagle, terrier & hound. They have many endearing qualities, for example: when a siren goes by they literally howl like wolves! They also have cute underbites.